If the answer is yes, what makes you think that? A negative self-esteem means you don’t feel good about yourself or your value, you feel of less worth than others and may believe you’re not good enough. We form this perspective from our personality, upbringing, conditioning in society and experiences in life. It can vary through different phases in your life and has been shown to peak at 60, so their’s hope for us all still!! If you do struggle with self-appreciation then you are more likely to see situations as negative and to catastrophise problems. Also, you’re probably sensitive to comments that are non-critical, taking them as negative. In comparison, someone with a healthy self-esteem enjoys growing as a person. They feel fulfilled and stand up for their wants, needs and opinions. It sounds good, doesn’t it! 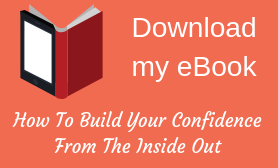 Well, it is possible to build your self-esteem and I have some strategies to share with you. Challenge your inner critical voice – we all have an inner gremlin that holds us back with words that persuade us not to take action. Or to do something that isn’t helpful (like that extra glass of wine) The words it says to you are just thoughts though and aren’t necessarily true. You can challenge your gremlin with other evidence. For example, if your inner voice says you’re stupid then think about all the things you’ve achieved that disprove it and your other strengths such as being thoughtful or creative. Avoid negative self-talk – when you’re not feeling good about yourself it’s easy to use critical self-talk without realising. Start noticing when you talk negatively about yourself to others (even in humour) and how often you internally tell yourself you can’t do something or you’re not good enough. Putting a stop to this type of conversation will make a huge difference to how you regard yourself. Drop the high expectations – It’s not just perfectionists that have high expectations. Anyone with low self-esteem can also have unrealistic standards for what they can achieve. Setting yourself up to fail like this will reinforce the message that you’re not worthy enough. Having a realistic goal isn’t a sign of weakness and think of the boost if you surpass it. Drop the comparisons – Are you a Facebook obsessive? Social media can be one of the biggest suppressors of self-esteem because you’re not comparing apples with apples. You’re comparing the window dressing of someone else’s life to the whole, good and bad of yours. Rather than focusing on other people who you think are happier, richer or luckier, move your attention back to you. Think about your aspirations, how you’d like to grow and how you can use your strengths. Do something nice for you – Wouldn’t you get pleasure from doing something nice for someone else? Then why not treat yourself the same way? For healthy self-esteem, it’s really important to take the time to do something you enjoy and not to feel guilty about it. Whether it’s time out to read a magazine, a shopping trip or a chat with friends. If it makes you feel good then don’t be guilty. Do something nice for someone else – As I said in number 5, helping out another person gives you a lovely warm feeling and builds your self-esteem. You could plan an act of kindness that you do regularly. Or look for opportunities to be altruistic and it doesn’t matter how big the gesture is. It could be holding open a door or letting a car in front of you in a queue or surprising a friend with flowers. Set yourself a challenge – This will give you the opportunity to gain a sense of achievement (remember about realistic expectations though!) Start small, perhaps attend an evening class, start the couch to 5K app, or ask a new colleague out for a coffee. The important thing is to acknowledge your achievement and celebrate it before moving on to another challenge. It’s something you can work towards but may not follow a straight path. Start with one of the ideas above and take some small steps forward, remembering to recognise any success.